alaTest heeft 566 reviews verzameld en geanalyseerd voor Hisense Sero 7 Pro M470BSA. De gemiddelde beoordeling voor dit product is 4.2/5, vergeleken met een gemiddelde beoordeling van 4.5/5 voor andere producten in dezelfde categorie. Gebruikers waarderen het gebruiksgemak zeer maar velen zijn minder positief over de apps. Het scherm is ook indrukwekkend. We hebben de consumenten- en expertbeoordelingen, de leeftijd van het product en andere factoren geanalyseerd. Vergeleken met andere producten in dezelfde categorie krijgt de Hisense Sero 7 Pro M470BSA een alaScore™ van 85/100 = Zeer goed. Very affordable. Sharp display with wide viewing angle. Mini HDMI out and microSD slot. Long battery life. Somewhat chunky build. Last year's performance. The Hisense Sero 7 LT has a Mini-HDMI port, expandable storage, and a competitive $99 price tag. The Sero 7 LT has a low-resolution and inconsistently responsive touch screen and low internal storage capacity, lacks Bluetooth and GPS capabilities, and restarts unexpectedly. The Hisense Sero 7 LT isn't worth your money -- skip it and go for its more robust counterpart, the Pro, instead. When I first heard that the Hisense Sero 7 LT was only $99, I was pretty excited. As the stripped-down version of the already decent Sero 7 Pro , the LT, or "Lite," had the potential to be an even more affordable, but still reliable, device. "Great value while it last"
Sometimes has a hard time sorting out wi-fi sites. Might burn up trying to execute an unexecutable command? 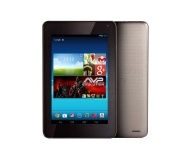 "Best value android tab you can get. I bought two!" It's great value, has a really nice screen and runs some high-resource demanding apps/games. It runs Clash of Clans and The Hobbit: KoM really well which is mostly why I bought it. When the device is plugged in and charging it thinks you are using more than 1 finger.